Shenyang is renowned for its historic significance and the city boasts many museums and ancient sites to honor its past. However, if you’ve already visited all the historic sites and are wondering what to do with your spare time on the weekend, one option is to hit up the Fantawild Adventure Park especially if you’re in the company of children. Granted, you’re not going to walk away feeling culturally enriched, but if it’s plain, silly entertainment you’re after then this is a good place to start. Located in Shenbei New District, Fantawild Adventure Park covers a whopping 60,000 square meters and is the largest fourth-generation amusement park in northeastern China. The park features dozens of thrilling, adrenaline-inducing rides. 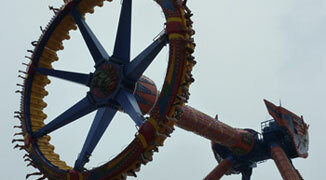 Below, we introduce a few of the best features of Shenyang’s number one amusement park, Fantawild Adventure Park. Mystical River (神秘河谷) is one of the most popular rides in the park. The ride’s theme draws inspiration from ancient Mayan Civilization legends and shoots thrill seekers down a steep water shoot, the scariest part being the 26 meter drop. Be warned though: you will get soaked even if you buy one of those cheap raincoats. Unless you don’t mind walking around in moist clothes for the rest of the day, bring a change of clothes and a towel. Named after the infamous volcano in Italy that destroyed Pompeii and Herculaneum in AD79, Vesuvius Volcano is a thrilling rollercoaster-style ride that thrusts people down the twisting mountain at high-speeds. The rollercoaster’s speed alternates as it rushes down the mountain, adding an extra thrill-factor to the ride. For 170 seconds, visitors will either be in adrenaline-bliss or scared out of their wits. Another ride not for the faint hearted: Flare Meteor (火流星) frantically twists and spins people around and upside down. You may want to skip this one if you’ve just eaten or are prone to motion sickness. Most people end up coming back to this ride for a second or third time because it’s so much fun. Sky Sailor (飞越极限) simulates flying in the sky and allows you to “travel around the world” in one unforgettable ride. The ride takes visitors to the foothills of Mount Everest, across the Eiffel Tower, past Victoria Falls, over Shanghai’s Oriental Pearl Tower and among herds of wild horses running through grasslands. Be warned: this highly stimulating ride gives the illusion of coming dangerously close to some of these attractions. Dino Rampage (恐龙危机) is a 4D cinema that catapults visitors into a future where dinosaurs have been brought back to life and threaten mankind. Cinema-goers are taken on an interactive ride through a city; but be careful: dinosaurs have multiplied so quickly that they can now be found in the most unexpected parts of town. As the name suggests, Space Scheduled Flight (星际航班) is a space flight simulator that allows you to go where no man has gone before. Explore the depths of the universe and watch the stars shoot by. 1) Food options within Fantawild Adventure Park are scarce and those that do exist are overpriced. We recommend bringing your own snacks to keep you energized. 2) Take a map of the park at the tourist service center on the right-hand side when you enter the park. 3) After you enter the park, don’t be tempted to get your photos taken at the cartoon castle straight away; queues are ridiculously long and you’ll just end up wasting time that could have been spent on something more thrilling and fun. Fantawild is a place of having fun , i love it. If u have never been there, please you should go there and see for yourself. I was there with my gf in April 2012. What a f***ing rip off of Disneyland! Almost 3 hours inline for a 5 minute ride. If you are smart, you'll want to pass on this one. Dear m.govinda,I am the doctor of Traditional Chinese Medicine,you can contact with me via Wechat ID:13898176026,and I need to know more about your situation.